Hi y'all! How is everyone? Did you have a good Thanksgiving? Here's a dish I made for the big meal that turned out yummy. Cubed butternut squash sprinkled with olive oil, salt, garam masala, cinnamon, red pepper and cumin then broiled in the oven. 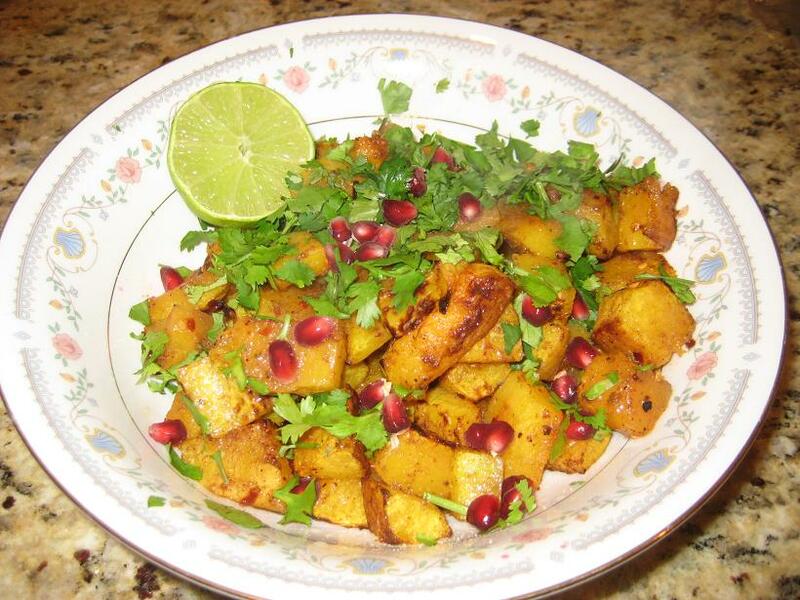 After it was softened and browned, I tossed in some cilantro, lime juice and pomegranate seeds. Made a pretty and tasty dish! 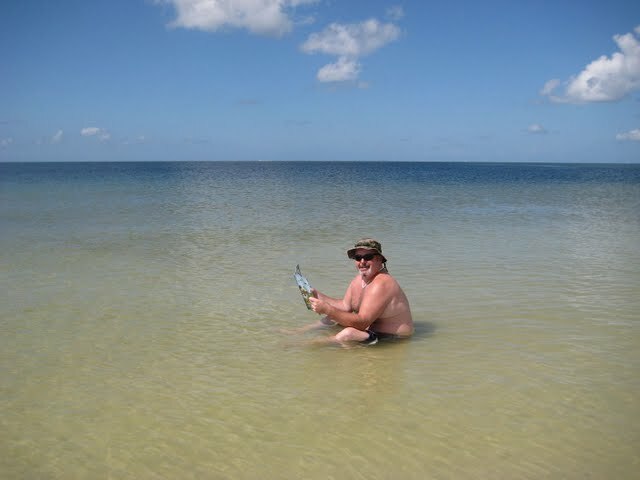 Oh I had such a great time on vacation - lots of fun with old and new friends. A little party time, a little beach time, a little nature time. All in all a great trip! The beach was lovely, but the highlight of the trip was the fantastic people we met. I love love love meeting cool new people, and Miami was filled with friendly international travelers ready for fun! We hung out with people from Chile, Italy, Las Vegas, Denmark, London, Netherlands, San Francisco, Mexico, etc etc. It was great! I know some of you also took trips over the holiday week - did you have a good time? My first Thanksgiving, gnawing on a turkey bone. I look like a butterball myself! Hehe! I had the most fantastic sashimi dish the other night, so I thought I'd share a photo with you. Sorry for the crappy photo quality, it was very dim in there. 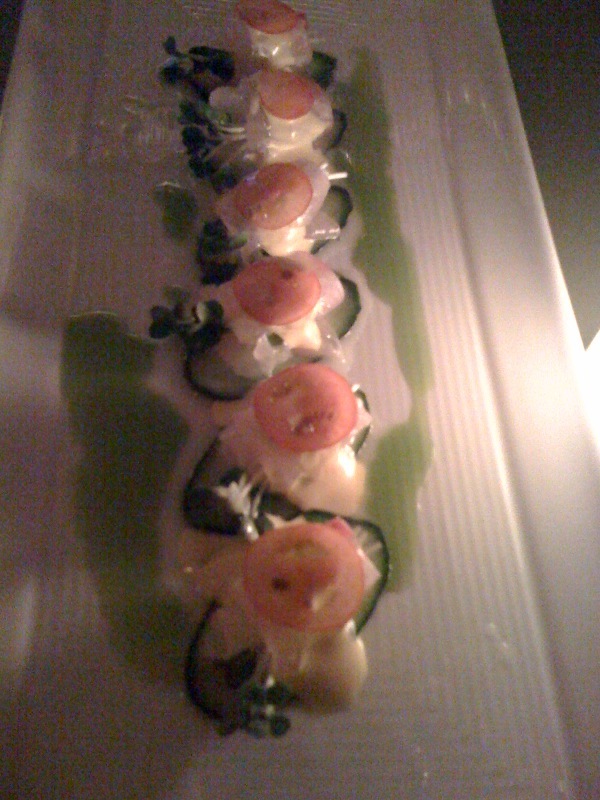 This was red snapper with thinly sliced cucumber, tomato, jalapeño, micro cilantro, and a spicy, citrusy sauce. It was unbelievably tasty! Pretty much a typical steakhouse with a twist. I ordered these yummy lamb chops which were served with olive tapenade and a sour cream sauce. The chops were perfectly cooked...yum yum! I came across a really cool feature in the LA Times - a photo album showing different types of winter squash. This is very useful to me as I see many different varieties at the farmer's market and am not sure which ones are which. However, I haven't ever noticed most of those pictured...there are some very cool looking squashes! 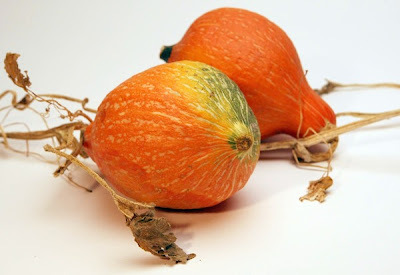 Hokkaido/Potimarron squash - I'm trying this when I find it!!! It's supposed to taste like chestnuts! Yum! Just in time for Thanksgiving in case you are planning to cook with some winter squash! I'm off on a little vacation for a few days. I'm very excited! Woo hooo! Now that's relaxing on vacation! Hopefully while I am away I can do a few posts on some of the yummy restaurant meals I'll be enjoying. My friend already selected an interesting dinner location that looks terrific from a paleo standpoint, other than the several cocktails I am sure to imbibe...hehe! I made thai green curry with fish last night. It was delish! I know this is a repeat meal, but I added a little something special this time...cauliflower rice! It made the meal even more like what you might eat in a restaurant. I tried to give the cauliflower a bit of flavor by adding grated ginger and garlic and a few drops of fish sauce. It was really tasty! I marinated the steak in chile powder, cumin, olive oil, garlic, lime juice, champagne vinegar and salt for several hours. I was too lazy to fire up the grill so I just threw it in a hot pan on the stove. I also made some guacamole with a small avocado, chopped jalapeno, lime juice, cilantro and salt. Happy Monday everyone! I hope you all had a fantastic weekend! Last night I made a tasty caesar salad for dinner with some grilled halibut. Yummy! I marinated the halibut chunks in lemon zest, lemon juice, rosemary, garlic and olive oil for about an hour. Then I threw it on the grill pan. Meanwhile I made caesar salad dressing by whisking together egg yolk, lemon juice, anchovies, minced garlic, worcestershire sauce and olive oil. Once the halibut was cooked, I tossed romaine lettuce with some of the dressing, a few grates of parmigiano and lots of black pepper. It was a delicious meal! A few weeks ago I picked up some walnut oil at the farmer's market. Have you had walnut oil before? It has a terrific nutty flavor for salad/veggie dressing and contains Omega 3s. Here's a little seasonal salad I created to go along with my walnut oil - haha! Greens, persimmon, pomegranate seeds, toasted organic walnuts, blue cheese, and bacon. A little walnut oil and a little lemon juice and voila! Dinner served. Sooooooooooooo tasty! Of course you can leave off the cheese, but that would be so sad. ;) A sliced hardboiled egg would be good instead of the cheese but can you believe I do not like hardboiled eggs? 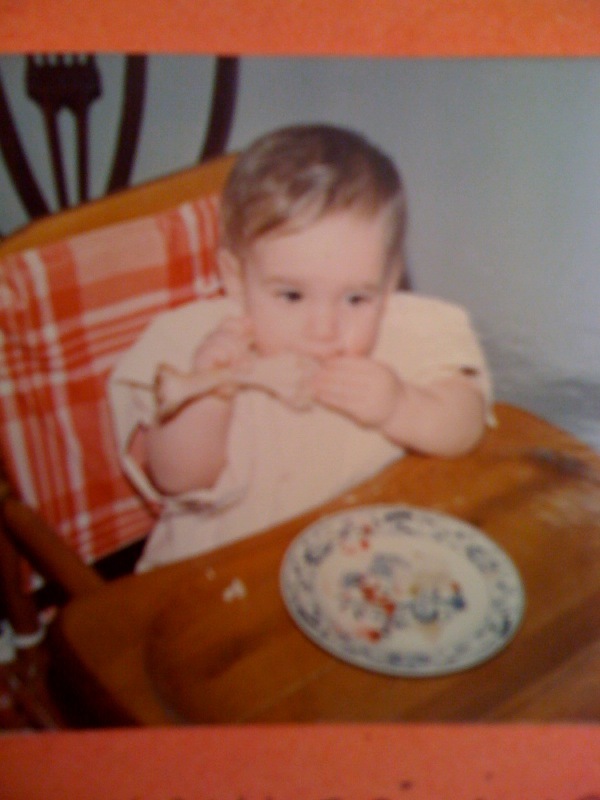 I love grilled lamb chops! LOVE! 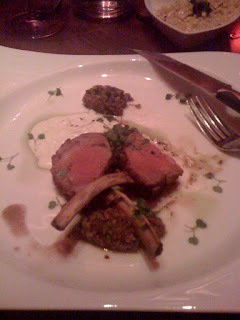 I finally picked up the free-range lamb chops I had ordered from a vendor at the farmer's market. The first time they accidentally handed me chicken gizzards instead of lamb chops. I was quite sad when I got home and opened the package, believe me. Then each week when I returned to trade for my lamb chops they had run out. So I was very happy to finally get them in my hands! I marinated the chops in oregano, thyme, olive oil, lemon juice, garlic and red pepper all day while at work. When I got home I heated up the grill pan and liberally salted the chops. I grilled them while in another pan I sauteed zucchini and red peppers in the left over marinade. YUM! I served this with some greens, a few pomegranate seeds and a glass of spanish red wine. These were the best lamb chops I have ever made. Perfectly salty, perfectly cooked. A little fatty but tender and delicious. Tasty treat!!! I hope you are all having a terrific week! My job has been sucking lately...sucking the life out of me! haha! Is it crazy that cooking is such a good outlet for me to escape the stresses of work? I am going on vacation next week though, can't wait!!! YAY! It's almost Friday!!! Any exciting plans for the weekend? This weekend I picked up some free-range pork at the farmers market and decided to make a spicy stew from ingredients I had lurking in the refrigerator. With a few old tomatillos, half an onion and some jalapenos...I could make a chile verde inspired meal! I sliced up the pork and mixed it with a combination of herbs and spices: garlic, coriander, cumin, red pepper, salt, garlic, thyme and oregano. I let it sit in the fridge for an hour or so, then browned it in a pan and set it aside. I chopped up the half an onion, two jalapenos, and three tomatillos and sauteed them in the same pan until a little caramelized. I added some lemon juice and zest to about three cups of homemade chicken stock, then threw the pork back in the pot. I put the cover on and let it simmer away on the stovetop for an hour or two. The pork softened, the veggies melted and the stock thickened to a spicy liquid. Served with a squeeze of lemon and some fresh cilantro...a hot and satisfying meal for a cool autumn evening spent watching Weeds on dvd. Terrific leftovers too! It seems I have been on quite the chicken kick lately. This weekend I cooked up some tandoori style chicken thighs. I went to the farmer's market on Saturday and then to some local ethnic markets. I got some greek yogurt at the greek market and some spices at the indian market. I also picked up a jar of this tandoori paste. Aside from acidic preservatives, there didn't seem to be any weirdo ingredients in it, so I thought I'd try it. I made a mix of the yogurt and tandoori paste, slathered it on some skinless bone-in chicken thighs and let them sit in the fridge all day. Later I cooked them up in my grill pan and served them with some cauliflower rice flavored with ginger, garlic, onion and spices. Alongside, a little yogurt with grated cucumber and lemon juice. Does anyone else go through phases where they cut themselves in the kitchen a lot? Last week I almost sliced the end of my left thumb off, and this weekend I grated off the side of my right thumb. I guess I am just really clumsy! :P My hands kinda hurt! hah! Be careful in the kitchen! Have a wonderful day! I went to an interesting event last night - a panel discussion about how farmers, purveyors, customers and chefs are working together to revitalize traditional farming and cooking practices by growing and eating everything on the farm. They are calling this the Nose to Tail movement. Mostly they discussed the challenges for small sustainable farms. Before the event we enjoyed a glass of vino and a snack at a little wine bar. 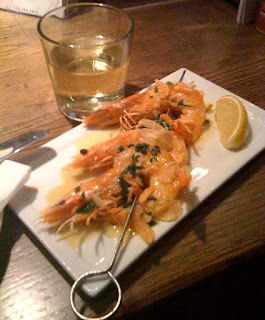 Gambas al ajillo and a glass of Albarino...yummy! Oh my friends, this recipe is very tasty! Not so quick, but tasty! Get out your heavy, lidded casserole pot and preheat the oven to about 275. Take a bunch of boneless, skinless chicken thighs and liberally coat the chicken with pimenton de la vera (I used picante) or sweet hungarian paprika, some cumin and some salt. Quickly brown the thighs on the stovetop then take the thighs out of the pan. Thinly slice two medium yellow onions and lay down in the pan as a bed for the chicken. Put the lid back on the pan and place in the oven for about 2 hours. The onions release their liquid and braise the chicken thighs, producing a lovely sauce and the tenderest chicken imaginable. If the sauce is too thin you can reduce it on the stovetop. Serve with cauliflower rice, mashed cauliflower or potatoes if you eat those. Some fresh herbs like cilantro on top and a squeeze of lime adds a bit of brightness. You could also make this in a crock pot I would guess...I don't have one so I used my lovely Le Creuset. We went to an Argentinian restaurant the other night. It was a far cry from the parrillas of Buenos Aires. Sadly it was not great, but I did eat some steak with chimichurri which made me think about making some for my own little 'parrillada' at home. I marinated a bison flank steak in red wine vinegar, olive oil, oregano, parsley, red pepper flakes and garlic while I was at work. When I got home, I threw it in a hot hot pan due to lack of a grill. I also made some chimichurri (a few days before and let it sit) with fresh parsley, oregano, thyme, garlic, red pepper flakes, olive oil and red wine vinegar. Sliced the meat up and served over an arugula and tomato salad. YUM YUM! Create a wonderful day for yourself and those around you today! Doesn't this look tasty? Chicken tortilla soup without the tortilla!!! This is the best soup ever in my opinion and a great weight loss food. Studies show that eating broth based soup helps people consume fewer calories throughout the day. This soup is a fantastic meal that I can eat all week long. It's spicy and savory and filling. I found the recipe (adapted below) from this Rick Bayless cookbook many years ago. It's been my favorite soup ever since. Have you watched his PBS cooking show? He seems like such a nice guy. First, add a little oil to a hot pan, and toast the stemmed, seeded chiles. Throw them in some hot water for 30 minutes to soak. In a big pot, saute the onion and garlic until browned, add a dash of cumin. Meanwhile, blacken the tomato over a flame. Blend the chiles, tomato, and about a cup of broth in a food processor or blender until smooth. Add the paste to the onions, and saute for a minute, then add the broth. Add the chopped greens, zucchini and chicken and simmer for about 30 minutes. Add salt to taste. When ready to serve, add chopped cilantro and a big squeeze of lime juice. Sprinkle the cotija cheese (queso anejo) on top. Eat happily! The other day while reading this fabulous NYT Michael Pollan article about food TV and how people don't cook anymore I came across an article on foot health. Curious, I read it to see what advice they would give. Some of the advice was good: don't wear high heels, walk a lot to strengthen your feet, don't be obese. I have always loved being barefoot. In high school I had to wear horrible uniform shoes to school. Instead I walked barefoot around campus which almost got me expelled (they were very strict with the uniforms). 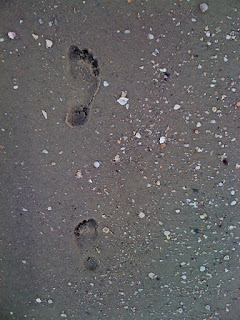 I walked barefoot all over the city. Yes, sometimes I got glass in my feet and my soles were dirty. I did break the bones in my foot twice - from jogging on hard surfaces wearing running shoes (stress fracture)...can I say I hate jogging? But friends suffered worse consequences than that, maybe from wearing shoes all the time? Many of them already have foot problems - flat feet, athletes foot, bunions, shortened achilles, etc etc. My mom has plantar fasciitis and let me tell you it is horrible. I'm afraid of something like that! Now I wear shoes most of the time out in the world because I grew up and cared a bit more what people thought of me. I wear high heels because they look nice and I am short! But I always take off my shoes as soon as I get home. 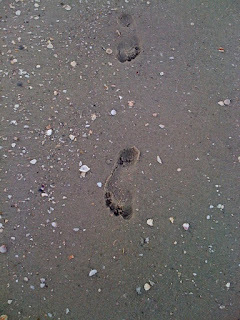 I like to walk barefoot outside too, and sometimes run/sprint/hike barefoot. What about you? What do you think about the need to wear shoes? Do you wear Vibrams or other funky non-shoes? Do you go barefoot a lot? Do you have foot problems...what do you do about it? Got some goodies at the farmers market and then decided to spend a few hours making some chicken stock. Is it weird that I am young(ish) and single and can do anything I please and yet I want to spend Saturday making chicken stock? Yes. Yes, it is. I fear I may be a loser. Oh well. At least I am a happy loser with a bunch of chicken stock! Easy to make stock, if you haven't done it before - save your chicken bits/carcass and veggie peelings in the freezer until you are ready. Then throw them in a pot and simmer away for a few hours. Voila! Chicken stock! To this batch I added red onion, chanterelle bits, thyme, cilantro, garlic, dried peppers, and half an apple. Random.